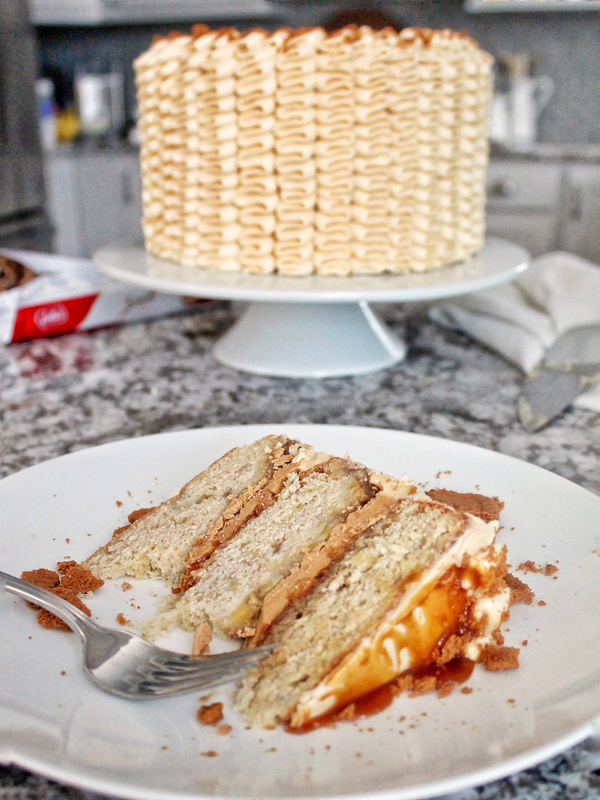 This Caramel Banana Biscoff Cake is filled with layers of banana caramel cake, Biscoff filling and salted caramel frosting. 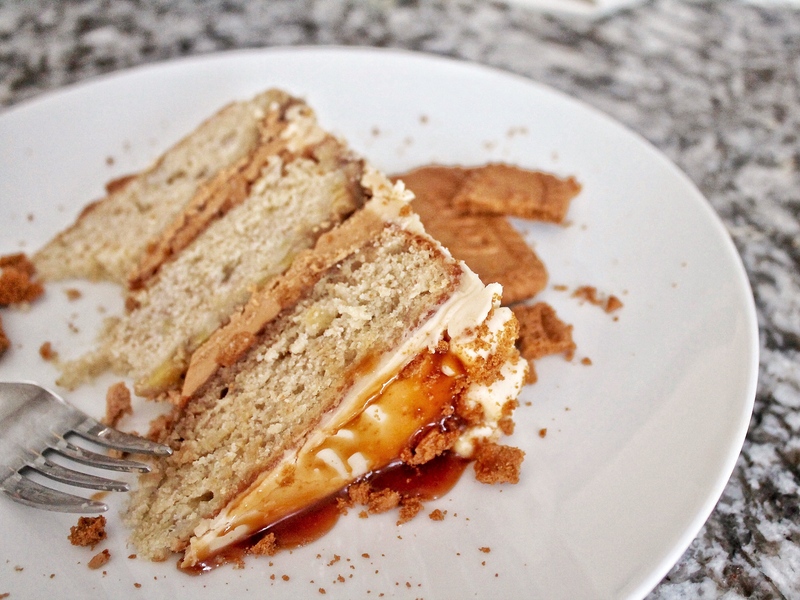 Excited to be sharing this Caramel Banana Biscoff Cake with you today! 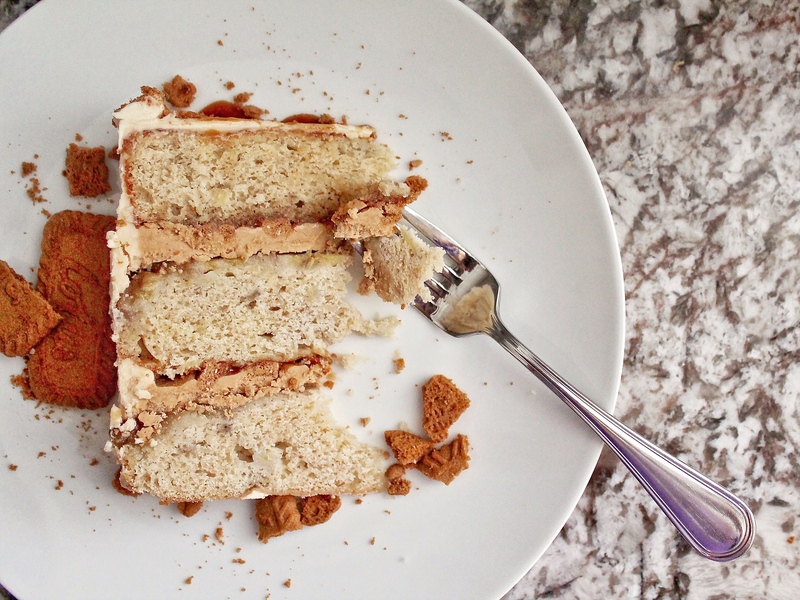 The idea for this cake came after I made my Biscoff Ice Cream (recipe coming soon). While I’m not one to usually eat ice cream with cake, I wanted a cake to go along with the Biscoff ice cream for a party we were throwing. As I thought about what flavors might pair well with Biscoff, banana and caramel were at the top of my list. I also knew I had a banana cake recipe from Sweetapolita that had been a total hit in my Banana Peanut Butter Caramel Cake. With that recipe in mind, I went to work. This time around, however, I didn’t want the caramel to just be a drip on the outside of the cake. I envisioned the caramel being a more significant part of the cake. 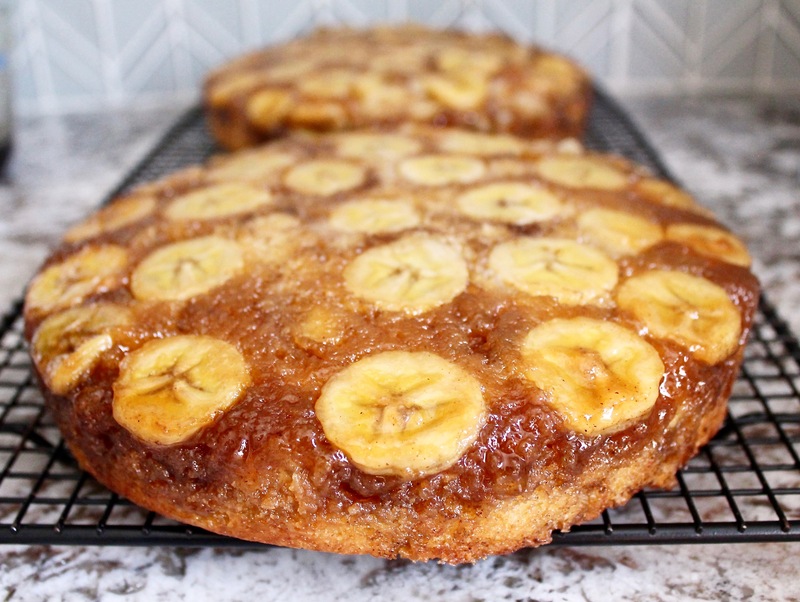 Similar to my Honey Pear Upside Down Cake, I decided to incorporate more bananas and the caramel flavor by baking them on the bottom of my cake layers. I couldn’t be more happy with how this element turned out! The brown sugar caramel sauce baked beautifully over the bananas and into the cake layers themselves, adding the extra caramel flavor I was looking for. For the filling, I made my Biscoff filling from my Biscoff Cake. It’s a simple filling, but is a total game changer in this cake, especially with the extra pieces of cookie added in. The hint of cinnamon in the cookies is a perfect combination with the bananas and caramel, and the cookie pieces add a bit of texture to the cake as well. 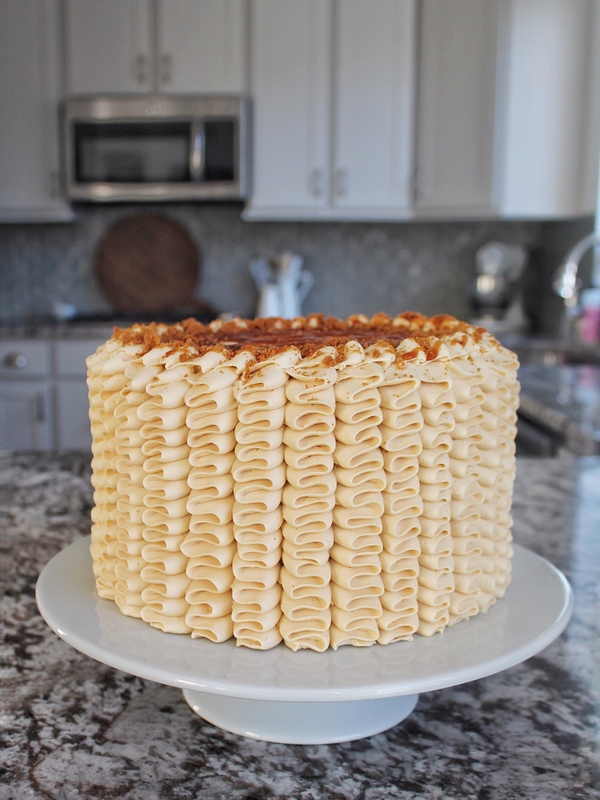 In addition to the Biscoff filling and cookie pieces, I also swirled salted caramel in between each layer and on top of the cake. I also added an extra half of the frosting recipe to make enough frosting for the ribbons around the cake. The amount of frosting listed in the recipe is enough to frost the cake completely without the ribbons. I made the entire cake three days before our party and froze the cake in plastic wrap until the night before. I then moved the cake from the freezer to the refrigerator to start thawing overnight. On the day of our party, I removed the cake from the refrigerator, took off the plastic wrap and let it get to room temperature inside a cake box. The cake tasted perfectly fresh and delicious! However, if you can, I do recommend making this cake as close to when you plan to serve it as possible. The bananas will brown more the further out you make the cake. If you’re looking to make some of the cake ahead of time, I suggest making the filling, caramel and frosting a few days early and saving the cake layers for the day of or day before. Whether you’re a huge banana fan or not, I think you’ll love this cake. The flavors of the caramel and Biscoff pair so well with the banana, even my chocoholic husband was licking the remains off his plate! Combine all the ingredients in a sauce pan over medium-low heat. Bring the mixture to a boil, stirring occasionally. Remove from heat and allow to cool for about 5 to 10 minutes before pouring into the cake pans. Preheat your oven to 350 degrees F. Spray three 8-inch round cake pans with cooking spray and line with parchment rounds, then spray the parchment. Set aside. Combine the milk and greek yogurt in a small bowl and set aside. Before pouring the batter in the pans, divide the sliced bananas into TWO of the pans, leaving one pan empty. After arranging the banana slices on the bottom of the pan, pour 1/2 cup of the caramel sauce over the bananas. Reserve a little sauce to soak the third (banana-less) cake layer after it's done baking. Once the bananas and caramel sauce are in the pans, divide the batter evenly between the three prepared pans, using a kitchen scale for the best accuracy. (For this recipe, you'll have about 1.4 lbs of batter in each pan). Carefully smooth the batter with small offset palette knife, and bake until a toothpick or skewer comes out clean, about 28 to 33 minutes. The cake layer without the bananas and sauce will take less time to cook. I took this layer out of the oven at 28 minutes. The two layers with bananas and sauce took 33 minutes to cook. When the cakes are completely cooled, level the one cake layer that doesn't have bananas and sauce on it. Using a pastry brush, soak the cake with the remaining caramel sauce. The cake layers can be made up to a week in advance, but I just making this cake as close to serving time as possible to keep the bananas looking fresh. If you plan to make it in advance, cover each cake layer with two layers of plastic wrap. When you're ready to frost your cake, take the cake layers out of the freezer an hour before you decorate. In the bowl of a stand mixer fitted with the paddle attachment, beat the butter on medium speed until light in color, about 2 minutes. Add the Biscoff spread and mix for another minute, until smooth. With the mixer on low, add the powdered sugar and mix until incorporated. Turn the mixer to medium speed and beat another minute. Can be stored at room temperature for a few days. Mix the sugar, water and corn syrup in a small saucepan over medium heat. Bring the mixture to boil, but DO NOT STIR! (Stirring encourages crystallization). Let the mixture cook until it turns to a golden brown/amber color. It happens quickly, so keep an eye on it. Once the cream is mixed in, add the salt, vinegar and vanilla. Stir to combine and then set aside to cool to room temperature before using. In the bowl of a stand mixer fitted with the paddle attachment, beat the butter on medium speed until light and fluffy, about 2 minutes. With the mixer on low speed, gradually add the powdered sugar followed by 1/2 cup of the salted caramel. Turn the mixer to medium-high and beat the frosting for about 5 minutes, until light and fluffy. On a cake plate or cake board, place one of the banana-lined cake layers on top. Spread half of the Biscoff filling on top of the cake layer. Because this cake layer isn't leveled, you'll need to get eye level with the cake to make sure you're spreading the filling as evenly as possible. You want the filling to be level even though the cake layer may be a little domed. Top the filling with three crushed Biscoff cookies and a couple tablespoons salted caramel. Place the second banana-lined cake on top of the cookies and caramel sauce. Spread the remaining Biscoff filling evenly over the cake layer, followed by the remaining crushed cookies and some more salted caramel sauce. Place the final cake layer top side down (the side with the caramel soak). 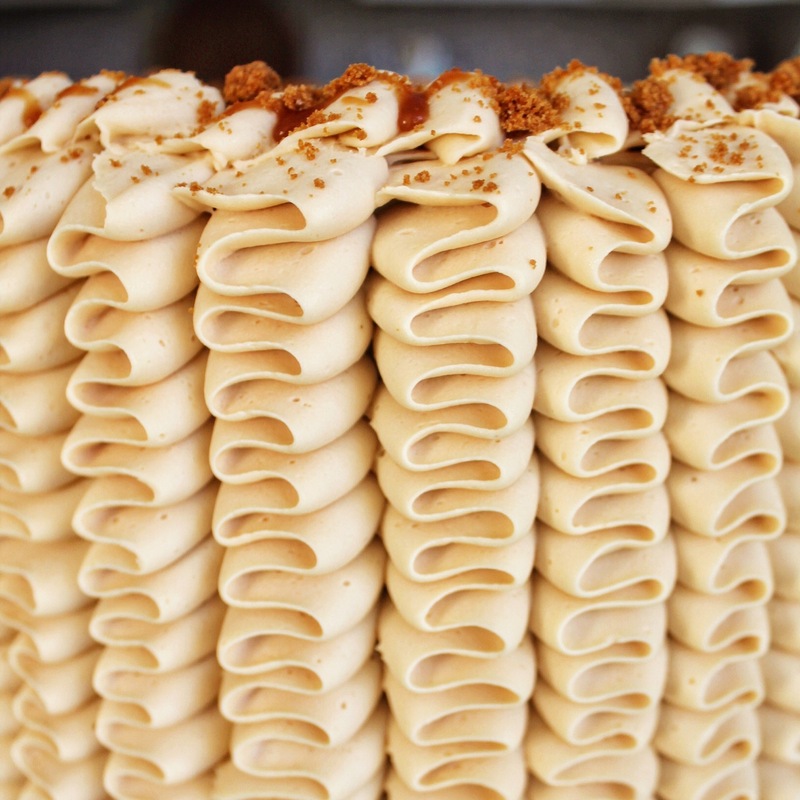 Cover the entire cake with a thin layer of salted caramel frosting to lock in the crumbs. Freeze the cake for 10 minutes. Once the crumb coat is set, continue to frost the cake with the remaining caramel frosting. If I make the filling and frosting ahead of time, do I store it in the fridge until it’s ready to use? Yes, and then bring back to room temp before using. I also rebeat both before using. How ripe should my bananas be for this recipe? And should the mashed and sliced bananas be the same ripeness? Slightly green, completely yellow, or slightly spotted?